The Southern Belle Loop offers a nicely varied itinerary, and it’s all done with a certain Southern charm. 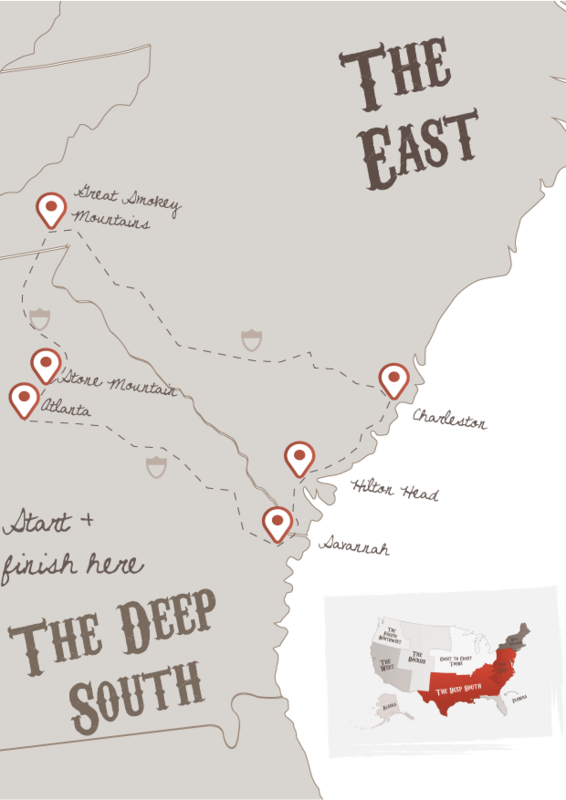 Endless forest covered mountains, the legendary Blue Ridge Parkway, southern belle cities and some of the east coasts best beaches are all on offer. Collect your car at the airport and head northeast for a short while before resting up for the night in the serene green space that is Stone Mountain Park, Atlanta. 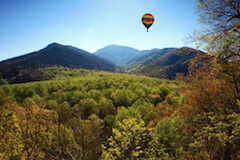 Tomorrow, you’ll start your road trip by cruising up to America’s most visited National Park - the Great Smoky Mountains. Ridge upon ridge of forest straddles the border between North Carolina and Tennessee in Great Smoky Mountains National Park. World renowned for its diversity of plant and animal life, the beauty of it’s ancient mountains, and the quality of it’s remnants of Southern Appalachian mountain culture. Awesome any time of year, but in the autumn the Smoky Mountains put on an amazing show of colour for hikers and driving enthusiasts. A second day to explore the Smokies, look out for wonderful wildlife like white-tailed deer, elk, black bear, raccoons, turkeys, woodchucks, and other animals. Had enough of the great outdoors? Then consider heading over to nearby Dollywood, the kitsch amusement park foundered by the legendary country singer Dolly Parton. Cruise up the legendary Blue Ridge Parkway, which is famed throughout America for it’s stunning scenery. The speed limit rarely exceeds 45 mph, so you won’t get to Asheville quickly, but you’ll be able to tick the Blue Ridge Parkway off your life list and the views will be so rewarding. A full day to explore lovely Asheville - This is a fast growing city with people moving here in their droves, with everyone looking for that fab mix of a buzzing food scene, and the great outdoors. 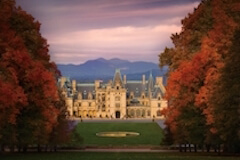 For tourists, highlights include exploring Downtown Asheville, the North Carolina Arboretum and the astounding Biltmore Estate. Time for your the fourth destination of your road trip, so you’ll head to the coast today. After a scenic start to the day, enjoying the vast views from Chimney Rock, you’ll then use the speedy I-26 to drive down to the ever so charming and evermore fashionable Charleston. Charleston is steeped in Colonial and Civil War history, and it remains a perfectly preserved and friendly southern belle of a city. Visitors fall in love with the cities grace, charm and history, which is usually enjoyed in the warmth of the South Carolina climate. The city is in a mini renaissance at the moment, attracting new restaurants and culture into it’s southern mixing pot. Around 100 miles south of Charleston lies Hilton Head Island. A barrier Island filled with various ways to enjoy your holiday time. These joys include golf, nature preserves and beautifully white beaches that often appear in “America’s Best Beach” lists. Swimming pool, golf course or the beach - the choice is yours! Not another day on the beach! If you where struggling to decide between yesterday’s options, then good news. You have a third day to enjoy the golf courses, swimming pools and the stunning beaches that cover this 12 by 5 mile island. It’s a short drive to Savannah today, so feel free to stay by the pool or on the beach before cruising down to sultry Savannah in the afternoon or evening. It’s been there since 1733, it isn’t going anywhere. Once you’ve arrived you’ll have 48 hrs to explore this beautiful city. As always, we’ll be happy to extend your stay here by an extra night or two if you wish, that goes for anywhere else on the trip too. Just let us know when you call for a quote. Over 2 square miles of lovingly restored colonial houses and commercial property expertly arranged around 21 of Savannah’s 1-acre squares. A great city to walk around in the warm sun that’s usually found here, no matter what the time of year. Look out for Forrest Gump whilst you walk, he likes the park benches here. Just don’t stay too long otherwise you might become covered in Spanish Moss like the large oak trees that form atmospheric tunnels throughout the area. Cruise back to the underrated and leafy city of Atlanta. ATL is packed with great things to see and do, so you’ll want to get there quickly in order to do as much as possible. Your road trip pack will list all the great visitor attractions - how many will tick off? Atlanta is a fast growing city that has exploded in size over the last two decades. However, friendly neighbourhoods still exist and they are nice to explore. Major shopping malls offer you a chance to hunt down the latest and greatest fashions and gadgets, whilst major visitor attractions offer amazing experiences, these include the World of Coca-Cola, CNN Museum, the gigantic Georgia Aquarium and Piedmont Park. Don't forget to check out this road trip's Itinerary tab to see more amazing pictures from our "The Colonial Coast" tour. You'll also be able to read a little bit about what you'll be getting up to on each and every day of this incredible holiday adventure.